This must have been the most frustrating 20 min of my life. It was when I realized that RevitLookup when downloaded does not come compiled into a DLL that we can just load into our Revit. Instead it comes as a RevitLookup.csproj that needs to be compiled using Sharp Develop for example. 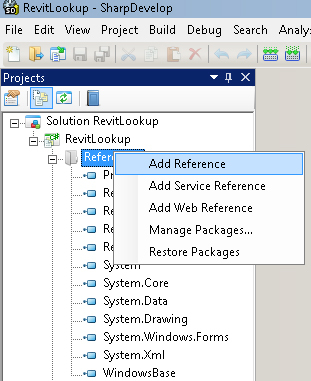 Below are clearly explained steps that one needs to take to get this to work…and work you have to make it since RevitLookup is ESSENTIAL to doing anything with Revit API. Install Revit 2014 SDK from here. Open SharpDevelop. If you don’t have it installed download it here. 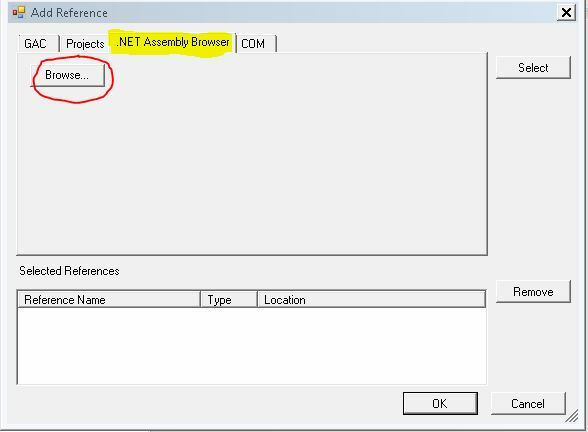 Go to .NET Assembly Browser and click on the Browse… button. Go to the C:\Program Files\Autodesk\Revit 2014 location and add both of the RevitAPI files. 6. Now you are ready to compile it. Hit Run Compiled Exec button and watch for errors. If it says that it was Build Successfully then you are good to go. The DLL will be saved in the folder that RevitLookup.csproj was taken from. If you get bunch of warnings with it, its OK as long as its compiled successfully. 7. Open Revit and any project. 9. Load the compiled RevitLookup.dll and then use the Save to Add-ins folder option. 10. Restart Revit and you should be good to go. Instead of downloading the SDK, you can download the latest source code for Revit Lookup from here: https://github.com/jeremytammik/RevitLookup . This has support for Revit 2015 also. Yes Luke! As a matter of fact your post helped me compile RevitLookup when I was doing it the first time around. I only had some trouble with adding references since I have never done this before, so I decided to expand a little on your post and add more detailed info. I think it might help the inexperienced programmers and average users get started. Thank you for the original post! Much appreciated. That’s what I needed. Thanks. Some download links doesn’t work. Andrzej, mozesz mi powiedziec dokladnie ktore? W ten sposob bede mogl je naprawic bez sprawdzania kazdej strony. Dzieki za komentarz i dzieki za wizyte na stronce. The ‘RevitLookup 2014 Download’ doesn’t work? Seems hard to find the 2014-version of Revitlookup, or maybe i’m looking in the wrong places…. I am sorry about that. The link is fixed now.